What is the MUSE system for treating reflux disease? If you have received a positive diagnosis of gastro-oesophageal reflux disease (GORD) or laryngopharyngeal reflux (LPR), the next step is to consider potential treatment plans. These can include reflux medication,diet changes, lifestyle modifications and surgery. Surgery is really only recommended if lifestyle measures or medication haven’t helped. There are a number of surgical treatments available – here we look at an incisionless procedure called the Medigus Ultrasonic Surgical Endostapler (MUSE) System. What is the MUSE System? Reflux disease often results from a weak or damaged stomach valve called the Lower Oesophageal Sphincter (LOS), which allows stomach contents to reflux into the oesophagus. The MUSE System is an endoscope device which incorporates a micro-camera, a surgical endostapler and an ultrasound sensor. It is used to wrap the top of the stomach around the lower end of the oesophagus, reinforcing the closing function the LOS. The MUSE procedure takes around 60-90 minutes and is performed under general anaesthetic. The device is inserted through the mouth and passed into the stomach where it is retroflexed. The video camera will identify the ideal location to create and staple a fold of tissue where your oesophagus meets your stomach. You can find more information on MUSE here. 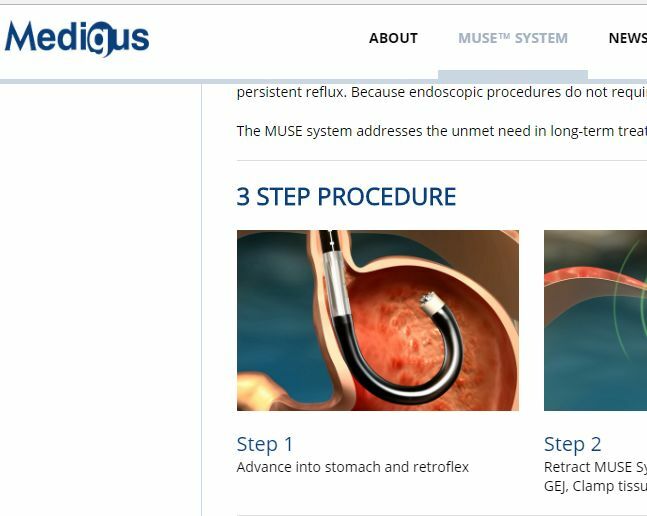 According to Medigus, the MUSE system is in use by leading gastroenterologists and GI surgeons throughout the United States and Europe. In clinical studies, 73 per cent of patients reported significant improvement in quality of life measures following a MUSE procedure, 85 per cent of patients significantly reduced their need for medications and 65 per cent of patients eliminated all reflux medication. After the procedure you will initially be placed on a diet of liquids and soft foods. Following the procedure, some patients have reported sore throats and minimal pain in their abdomen, but these symptoms cleared within a few days.